The culture of the Southwest celebrates the vibrancy of life through the frequent use of bright colors. I can feel the warmth of the sun as it is reflected off adobe buildings and prickly cacti. Many of my paintings capture the contrast between strong sunlight and the coolness found in the shadows. There are rich colors and fascinating shapes hidden in the shadows. Watercolor is a wonderful medium for allowing the free flow of color. Beautiful colors can easily be created (by choice or accident) that one never knew existed! Because of its transparent qualities, watercolor lends itself well to the painting of landscapes; it gives a feeling of airiness that I strive to achieve. 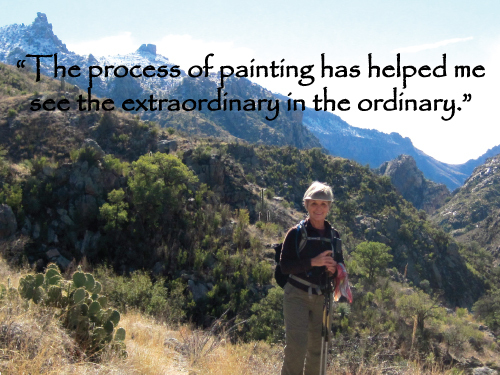 I also enjoy working with oils and acrylics; both mediums work well to express the denseness and intensity of colors of the southwest and portraying the strong contrast between light and shade.